Bhutanese royal family released January 2018 Calendar. The photo in January calendar showing together King Jigme Khesar Namgyal Wangchuck, Queen Jetsun Pema and Crown Prince Jigme Namgyel Wangchuck was taken during Bhutan's 2017 National Day celebrations. 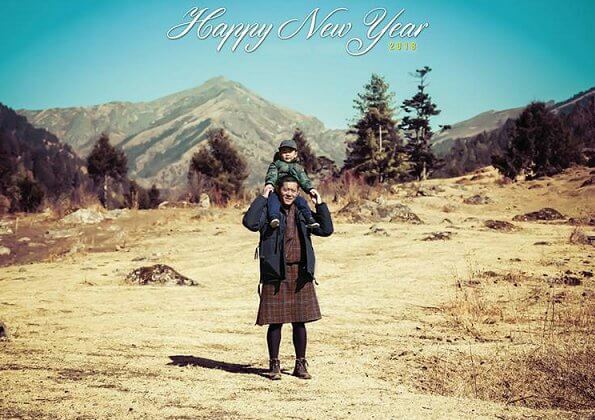 In addition to that, King Jigme Khesar Namgyal Wangchuck congratulated the New Year of everyone with a photo showing his son Crown Prince Jigme Namgyel Wangchuck on his shoulders. Beautiful family! Happy New Year to all!